Think salads 🥗 are boring? 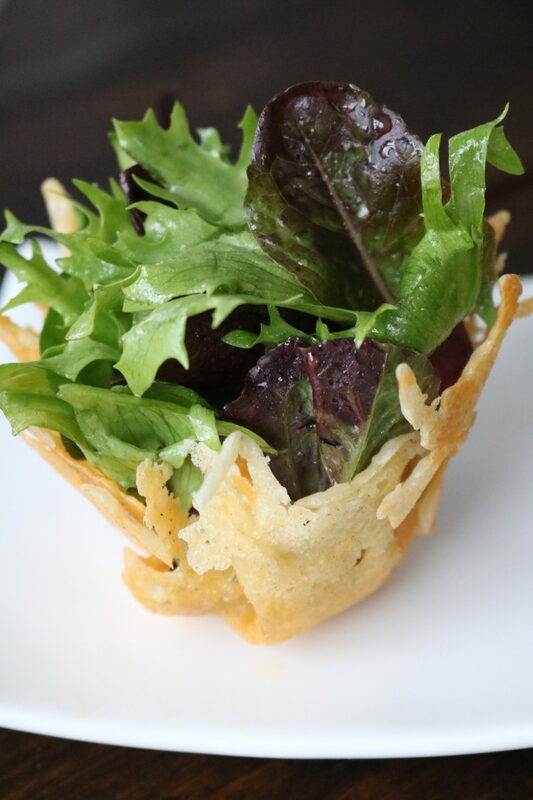 Think again 😉 because you’re definitely going to want to try our Garlic Vinaigrette Baby Greens in this cute little Parmesan Cup! 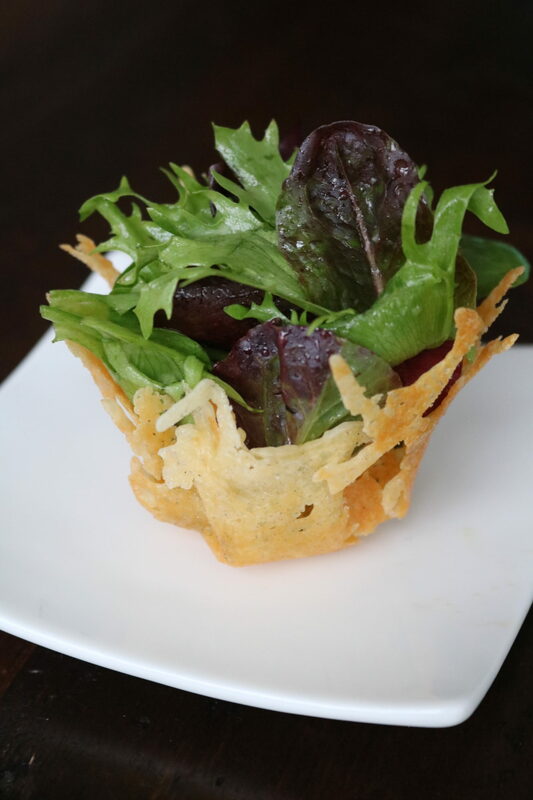 The perfect way to serve salad at a partayyy. Preheat your oven to 375 degrees and prep your baking sheet by lining with a slip mat or wax paper. Mound approximately 2 tbsp of Parmesan cheese on mat and gently spread until they are about 5 inches in diameter. Bake until until visibly golden all around the edges. Use a metal spatula to transfer the Parmesan cups to a muffin tin. Gently mold Parmesan cups to fit the shape of the muffin tin. Let cool until firm. Continue process in batches. Add mustard, salt, and minced garlic to a small mixing bowl. While whisking slowly stream in olive oil to create an emulsion. Stream in balsamic and red wine vinegar and whisk until combined. Taste for seasoning. Add greens to a large mixing bowl and start adding dressing 2 tbsp at a time, tossing gently with tongs until dressed to your preference. 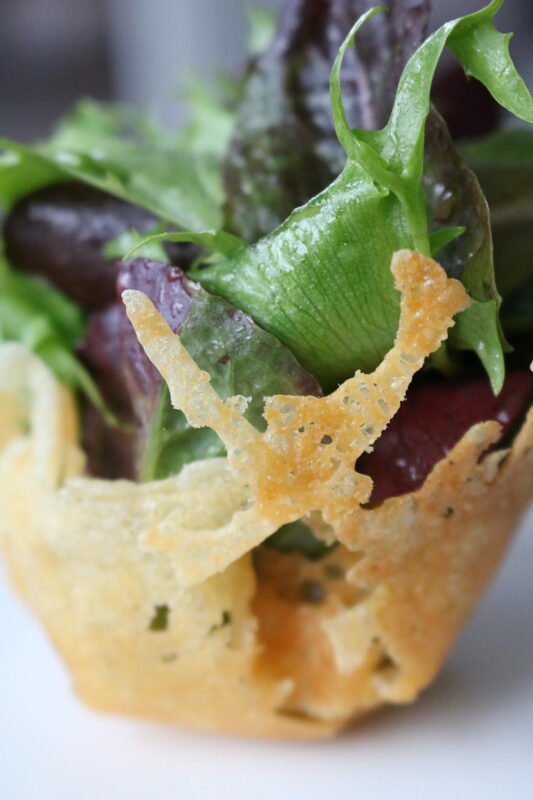 Tong dressed greens into mini Parmesan cups and top with freshly cracked black pepper. Enjoy!